The origin of Kovair DevOps goes back to 2016 when we met a Gartner Analyst in Si Valley regarding their thinking and analysis on DevOps products. What we learned from him is that there is no single product that he would describe as DevOps Tool. He told us that there is a whole list of products that combined in some manner to offer a DevOps Solution to the market. He then shared a chart with us that had a list of about 48 tools from multiple vendors and open sources! This led Kovair to think of a unified product offering for DevOps that combines several of these tools through our Omnibus Integration Bus that we knew is well accepted in the industry. In addition, we knew we had to incorporate Jenkins capabilities of managing the pipeline and various other functions such as fetching the code, orchestrating the build, triggering automated testing and so on with full real time visibility. We also decided that it has to be a true full DevOps solution with tools coverage for Development -Dev until code is ready and then doing the Operations functions for the Ops – all in proper sequence for a true Solution that majority of prospects would accept and will be a true DevOps product in the market compared to point function tools such as just build and release tools that vendors are classifying as DevOps tools. Kovair DevOps is not just a tool for any one component of DevOps like CP, CI, CD, CT & Continuous Deployment but is a holistic package, which ensures a smooth and successful DevOps journey for an organization. Along with integration of 80+ best of breed tools through the Kovair Omnibus Integration Bus, Kovair DevOps also offers enterprise class mouse click configurable workflow for orchestration, central database for all the data and analytics, and collaborative platform for near real-time collaboration to make it what we call a “Single Click” operation. Kovair Omnibus, a SOA architected ESB having integrations cutting across different vendors and technologies which can be described as deep integrations! Front end full development capabilities for Agile or Kanban methodologies as desired by the customer along with multiple capability choices for source code management tools such as GitHub that are integrated through the Omnibus. We have formal partnerships with a few of the global service providers such as HCL, Cognizant, Mphasis and more if that is the route the customers choose for their implementation services. At the time of evaluating whether to undertake a technology transformation initiative with a focus on continuous improvement, every organization and technology leaders often ask about the return on investment. While this white paper focuses on calculating the return aspect of ROI from Kovair DevOps, remember to include costs beyond the technology acquisition in your investment calculations. Important considerations include training, lost productivity from learning and integrating a new technology or way of working, long-term maintenance costs, and any lost time spent re-architecting and replacing existing systems. Based on the team, organization and their current method of working, these costs vary from organization to organization. Every ROI calculation have two categories value-driven & cost-driven. For many, a value-driven approach takes more priority or at least have equal importance with cost-reduction efforts. With a strong appreciation of customer demands, the availability of new technologies, and competitor pressure, visionary technical leaders understand this and are notably optimizing for speed over cost, which is a significant shift in mindset (a strategy cited by DevOps leader Courtney Kissler4). On the other side, value lost can be attributed to spending of resource hours on unnecessary rework and manual testing. This time could have been used for new features or additional automated testing. Though value lost from postponing new products or features is also a key concern, it is ignored due to complexity of calculation. This lost value includes the revenue that could have been earned by having the customers, if it had released software more quickly. In a cost-driven approach, the focus is primarily on cost savings. In case of implementing DevOps, organizations mainly look into factors like cost of downtime and the cost of manual vs. automated work. These savings can be achieved by adopting lean practices and continually improving your work to achieve efficiencies, such as eliminating sources of waste and unnecessary rework. Kovair DevOps built on Omnibus integration platform having available integrations with 80+ commercial tools has an extensive coverage of all phases of delivery. 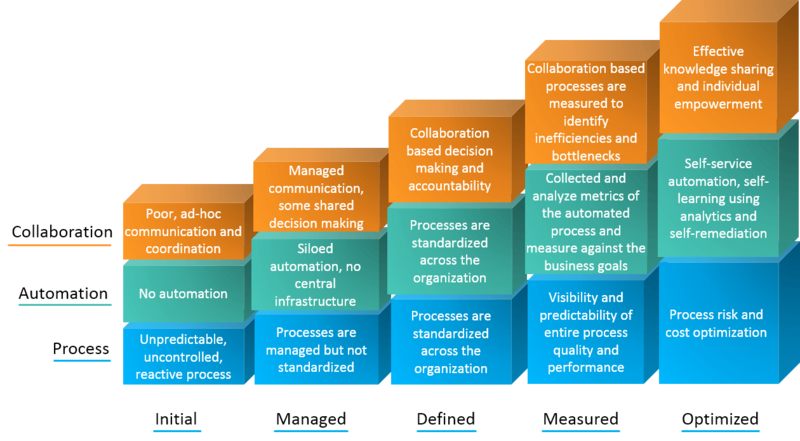 It successfully brings continuity to all these phases supporting 7C’s of DevOps as mentioned below. Kovair DevOps uses its own task-based workflow for orchestration on top of Jenkins pipeline to allow organizations implement a true “One Click” DevOps where everything happens through automation once the code is checked in to the SCM tool. Implementation of Kovair task based workflow along with notification not only ensures that all the activities outside Jenkins pipeline are streamlined and are being centrally governed but also ensures minimum manual handshake between teams. With this capability, Kovair DevOps contributes to the ROI both from value and cost perspective when it comes to implementation of DevOps. Quality gain: The ability to do things like code analysis, unit testing, and code coverage from within the IDE helps developers to ensure code quality before checking in the files. This leads to quality gains and defect reductions at an estimated rate of 12% to 15%. Considering the fact, a good amount of savings can be easily had based on the average size of the groups, their average compensation, and overhead costs. DevOps talks about continuous testing which promotes the philosophy of testing continuously with the help of test automation. It reduces the longer test cycles making the test process much more efficient and helps in early detection of bugs in the entire process of delivery. Here are some of the benefits that testers get when continuous testing gets implemented using Kovair DevOps. Productivity gain: Let us consider that testers spend around 10 hours of time for repetitive testing of the same scripts in different environments like development, staging, and production. With an integrated environment as mentioned above, these repetitive jobs can be almost eliminated. Thus, the productivity of testers improves by almost 60% to 70%. Though, through test automation a huge gain in productivity can be achieved, but when it comes to invoking those scripts for execution, it is manual. With DevOps and continuous testing, this is taken care of and as soon as the build is done, test automation scripts are fired as a part of the pipeline. In addition, the productivity of testers improves by around 15% to 20% for not having the need to interact with other tools and team members for information gathering on requirement specification, development, and build status. Quality gain: An integration with the test automation tools enables organizations to achieve a CI environment. Synchronous automation testing on successful build completion not only allows detecting early bugs but also allows more number of test cases to be executed. Automation testing itself improves the quality of delivery because of higher test coverage but the ability to execute it on successful build completion makes the process more efficient. This can lead to a gain of 15% to 20% in terms of time lag between build and start of testing. This type of integrated environment also provides more time for test case verification and thus reducing post deployment bugs by 30% to 35%. A good amount of savings can be easily had based on the average size of automation scripts, size of involved groups, their average compensation, and overhead costs. Kovair DevOps not only improves the productivity and quality from individual team’s perspective but also improves the productivity and quality for the frontline managers who are usually involved in planning and require continuous feedback in real-time manner. Below are some of the points to elaborate on this thought. Productivity gain: Let us consider that a manager spends around 15 hours a week on different meetings with respect to the overall progress of a release and gathering information for generation of reports and creation of reports. With the facilities of real-time status update of progress, cross-tool databased reports and dashboards offered by Kovair, it has been observed that time involvement in these meetings and report creation reduces by at least 50% i.e. around 7.5 hours for a manager. Quality gain: The ability of having real-time cross-tool reports and dashboards, traceability, and central governance through task-based workflow cutting across different tools provide much better and informative control over the entire release progress. This leads to quality gains and timeline failure reductions at an estimated rate of 30% to 35%. A good amount of savings can be easily done based on the average size of the groups, their average compensation, and overhead costs. 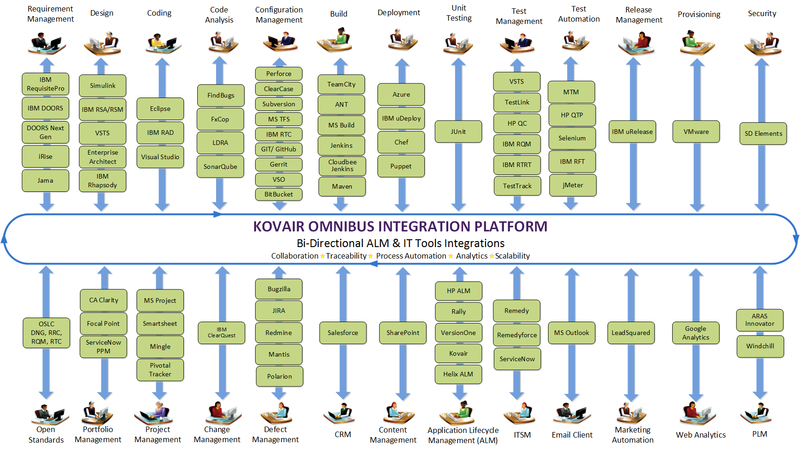 Kovair DevOps is built on Omnibus Integration platform from Kovair, which currently has integrations with 80+ commercial tools covering different aspects of application lifecycle and delivery. With all these integrations along with capabilities like task-based workflow, notification, and business rules it helps organizations to reduce time to market. Kovair DevOps not only supports integration with commercial tools but also integrates with in house tools of an organization helping them to protect their investment while implementing DevOps. The total set of integrations that Kovair offers today is given in the diagram below. Kovair DevOps with its current set of 80+ integrations has coverage to all phases of the lifecycle. The below diagram (Fig. 2) shows the list of supported tools across different phases of DevOps.